This is the family email I sent after having my head examined. 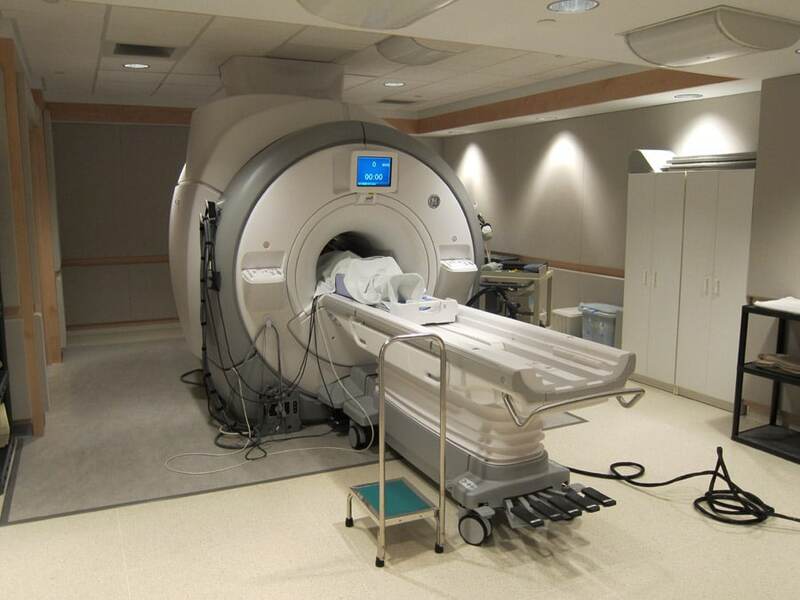 I’m in Madison for the brain scan. On the way into town I stopped to get some groceries. The woman taking my credit-card looked at it and said, slowly, “Steve Tibbetts. From Memorial High?” I said, “Yes! Who are you?” She told me her name. I didn’t remember her, but I said, “Oh HI! Hey! Wow! It’s great to see you!” We chatted for some time while I tried to remember who she was. No luck. 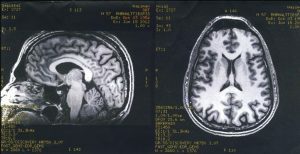 I was wondering if my brain scan would show early-onset Alzheimer’s. I came home and Dad and I both drank one beer each. I went to the Waisman Center the next morning at 8:15 to meet my contact, Antoine Lutz. 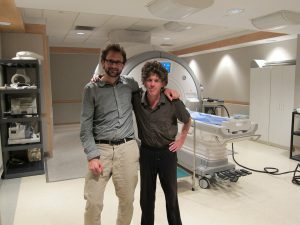 Antoine is a French neuroscientist studying with Richard Davidson here at the University of Wisconsin. I walked through the Waisman Center and found the Center for Healthy Things or whatever it was. Here it is: the Center for Investigating Healthy Minds. The Laboratory for Affective Neuroscience is the center that Richard Davidson started. 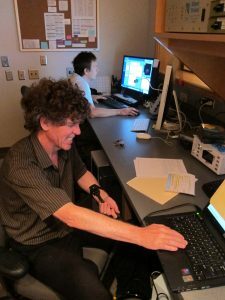 That facility looks into the inner brain workings of autistic children, teens, depressed adults, and those with other sorts of cognitive issues. 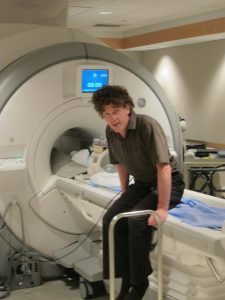 The Center for Investigating Healthy Minds is an adjunct faculty that deals with what he calls “contemplative neuroscience.” I was referred to Richie by Cortland Dahl, one of his PhD grad students in Minneapolis. Cortland knew I’d logged the requisite 10,000 hours of meditation over the years and Antoine recruited me for this study. I found the CIHM center, walked in, and there was the Lama Khenpo Kunga having breakfast with some of the staff. I’d given him a ride to the airport in Minneapolis after the St. John’s program in 2011. He’d done the brain scan the day before. Another participant from the meditation retreat held up his iPhone and took a photo just as I came in. 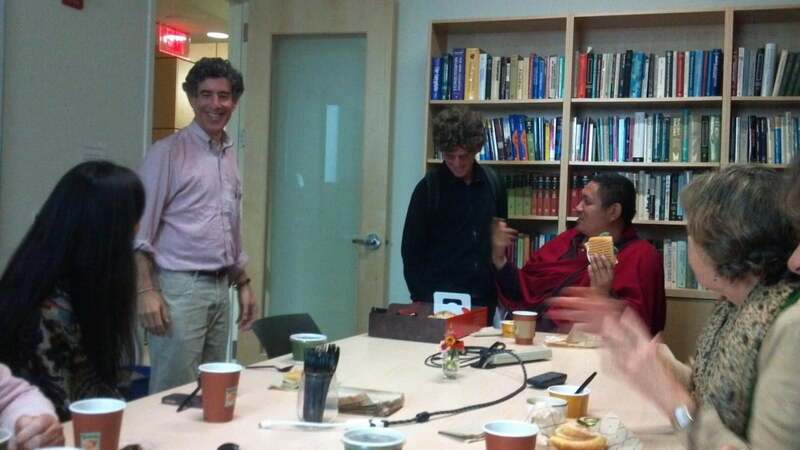 That’s me saying hello to Khenpo Kunga with Richie Davidson coming over to hug me. Mary knows about Ritchie Davidson, having read several of his more scholarly tomes on mindfulness in the course of her work with Ed Podvoll and the Windhorse organization. 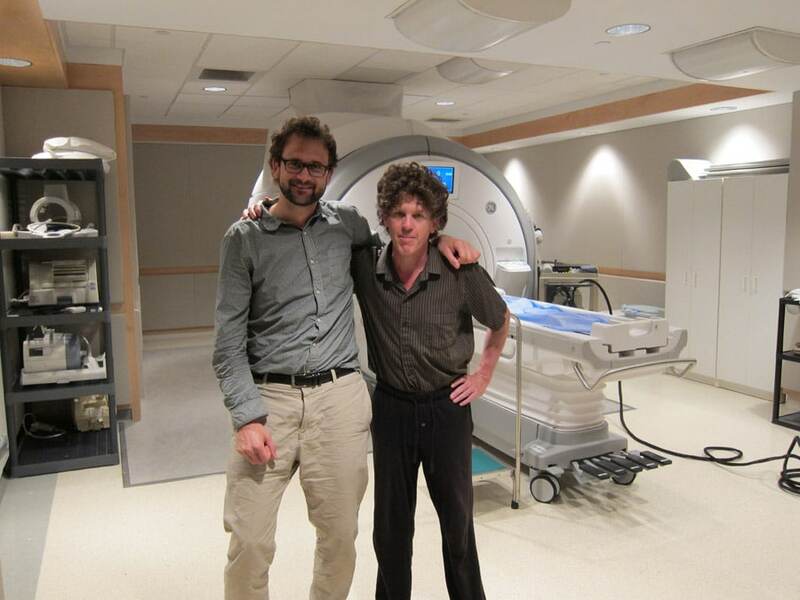 I was startled that this major player in cognitive neuroscience would just walk up and hug a total stranger. I hugged him back, sort of. After breakfast Antoine and I went down to his office and went over the procedures for the day. Antoine is French and speaks English perfectly, but rapidly. I had some trouble understanding him and wondered if the French language part of my brain was getting its wires crossed. (I used to be pretty good, having had a French girlfriend, and all, remember?) Antoine had me sign lots of paper, assuring he and the center that I was not claustrophobic, had no metal in my body other than fillings, and wanted to be notified if they found any brain anomalies, like tumors. Can you imagine deciding you’d rather not know if they found something? 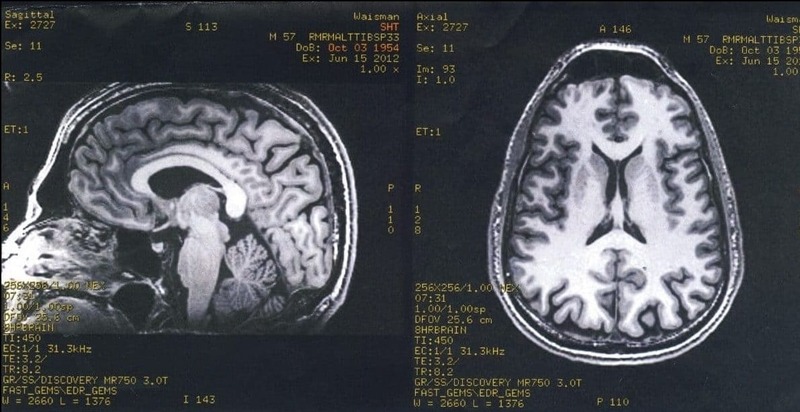 You’d check the “I do not want to know” box and, on the way out, the imaging technician would say, “Hey, have a nice rest of your day, I guess,” and you’d wonder if he’d seen that your brain was riddled with tumors. We went into the lab and went over the procedures. 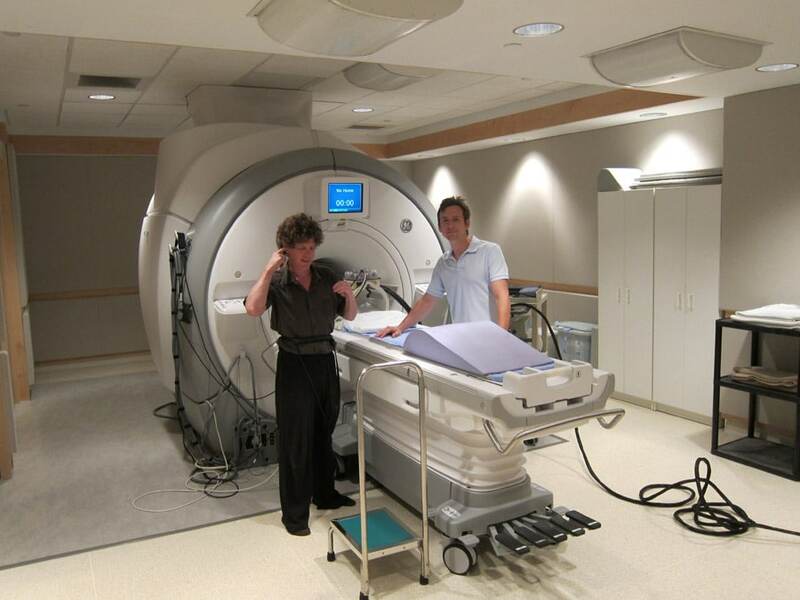 This was the plan: I would lie down on the MRI scanner platform and be outfitted with some devices. I’d have a band strapped around my chest measuring respiration, a clip on my finger measuring my heart rate, a bulb I could squeeze if I wished to be ejected from the machine, a small panel with three buttons in my right hand that I would use to communicate data to Antoine and the technician in the control room, and a device strapped to my left forearm that would deliver a gradually-increasing burning sensation to my skin. Then they’d load me into the tube. I was to do four things while in the tube. First, if Antoine flashed the letters “OP” on the screen I was seeing through the goggles, I was to remain in what is called “open presence” or “rigpa”, for those who know that word. If I saw the letters “FA” I was to focus tightly on those two letters on the screen in a way we call “shamatha with support” or “focused attention.” At various times the device strapped to my arm would heat up to some level or other, and after it peaked and tailed off, I would use the button panel to indicate (from 0 to 10) the level of the burning sensation, and (from 0 to 10) how much suffering it caused me. They would be watching my brain during the simultaneous meditation and burning and see how I handled it. I’d suggest you watch this part of the movie, because I kept thinking about it on the 5-hour drive down from St. Paul. Start from about 40 seconds in. I popped in some ear plugs they gave me (the machine was loud) and put the respiration belt around my middle. I laid down on the sliding panel, the technicians attached the heart monitor and other devices to my hands, and they slid me into the machine. It started whirring and clunking. The technicians closed the door to the lab and went back into the control room. My heart was beating really fast, and knowing that Antoine and the technicians were monitoring my heartbeat made it speed up even more. We started. Open Presence. Burning. Focused Attention. Burning. “Put your hand in the box.” There were speakers inside the machine. Antoine occasionally asked, “How are you doing?” I always replied that I was doing fine. 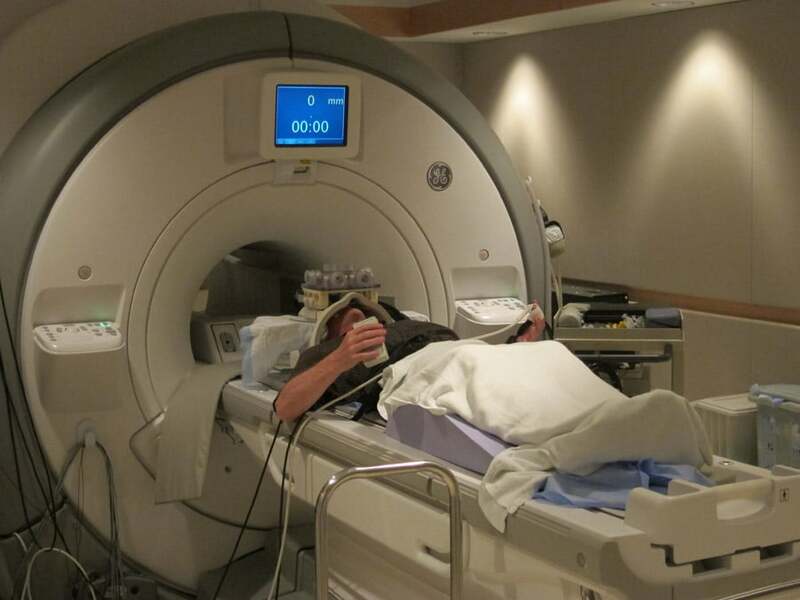 The machine was very loud, and I couldn’t really move my neck or head for quite some time. Amazingly, the burning pad did not leave a mark on my skin. But he didn’t. The technician took our picture, and then Antoine and I spent some time in the control room talking. Richie came in, hugged me, and gave me an autographed copy of his book. Then I came back to Oakwood and Dad and I had a beer apiece again. We had a nice dinner. I typed this while Mom and Dad listened to a book on tape.